The loss of a lower limb has severe implications for a person’s mobility, and ability to perform activities of daily living . This negatively impacts on their participation and integration into society . The ultimate goal of rehabilitation after limb loss, is to ambulate successfully with the use of a prosthesis. Prosthetic rehabilitation is a complex task that ideally requires input from a interdisciplinary rehabilitation team. However, most often physiotherapists are in charge of the physical rehabilitation process . A young patient who suffered an amputation as result of a traumatic experience will most likely be in some stage of the grieving process, and be in acute post-surgical pain. An older patient who suffered a dysvascular or neuropathic limb loss, might have had some time to psychologically and physically prepare for the loss of their limb. Either way, your patient might be psychologically and physically distressed when you start the rehabilitation process, so early discussion and education about the patient’s expectations and goals are essential  . The Psychological Aspects of Amputation. Your patient will look to you to provide early information about the possibilities for a prosthesis. Ensure that you have a basic knowledge and understanding of the prosthetic technology that is available and could be appropriate for your patient (Prosthetics). Patient education should commence with a discussion regarding the rehabilitation process, and patient-centred goal setting. The patient should be educated with regards to their potential options for assistive and prosthetic devices . Managing the patient’s expectations with regards to the acute post-surgical pain they will potentially experience during the rehabilitation process will enhance patient cooperation and improve the rehabilitation outcome   . Education on limb care of both the residual and sound limbs are vital in preventing further complications, and the possibility of re-amputation. Patients should be educated on diabetic foot care and advised to visually inspect the sound limb daily for any signs of redness. The primary caregiver of the amputee should be involved from an early stage of the rehabilitation process and educated on all the rehabilitation techniques that are taught to the patient in order to improve patient compliance on discharge. Management of the surgical scar is also important when preparing the residual limb for prosthetic fitting. A scar that is hypersensitive or uneven can make weight-bearing on the stump very painful or impossible. Once the surgical wound on the residual limb is adequately healed, the therapist should initiate a regime of desensitisation of the stump in order to prepare the stump for weight bearing on a prosthesis and scar massage to prevent adhesions of the scar to bony prominences   and teach the patient how to perform it themselves. See Acute post-surgical management of the amputee to read more about post-op dressings. Shaping or coning of the stump is a vital part of pre-prosthetic rehabilitation    . A stump that is poorly shaped or bulbous in shape (distal circumference measured 5cm proximal to the end of the stump is larger than the proximal circumference) cannot be fitted with a prosthesis, or greatly complicates prosthetic fitting (see figure below). 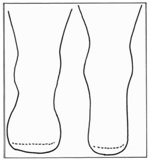 Stump bandaging or coning is essential in shaping the stump. 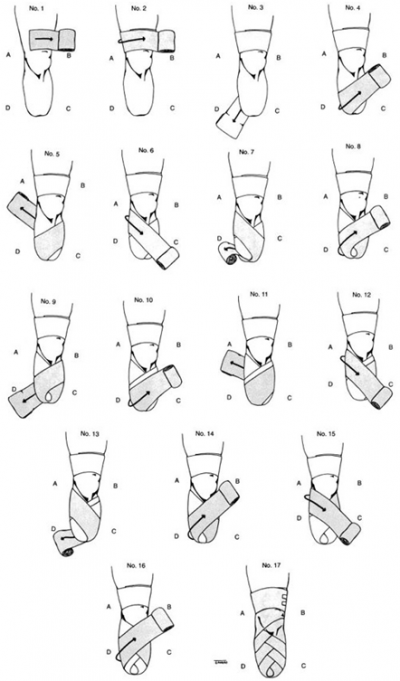 See the videos and diagrams below on how to perform stump bandaging for a transtibial and transfemoral amputee. Exercise forms a large component of pre-prosthetic rehabilitation. The different elements of a pre-prosthetic exercise programme that should be included and tailored to the needs of the individual patient are listed below . Early post-operative mobilisation is imperative to prevent deconditioning after amputation surgery. Ideally patients would be mobilised with an assistive device such as a walking frame or elbow crutches, but often this is quite challenging in patients with co-morbid diseases. The use of a pneumatic compression splint prosthesis is advised for patients with limited physical function and mobility . This type of inflatable splint fits around the residual limb without putting pressure on the wound, and can be used to facilitate early mobilisation, and to assess the potential for prosthetic rehabilitation . Another alternative for early mobilisation in high-risk patients is the application of an immediate postoperative prosthesis (IPOP) . The non-removable rigid dressing used for an IPOP is applied by a Prosthetist in the theatre, and is shaped around the residual limb for patellar-tendon weight bearing to avoid pressure on the wound during early mobilisation . Patients will have to be assessed in order to determine which assistive device is most appropriate for early mobilisation, and then taught how to mobilise safely with these devices. An important step in the rehabilitation process is regaining functional independence. The amputee should be taught how to safely and if possible independently transfer themselves between the following surfaces especially in the case of a double lower limb amputee, or a frail person. See the videos below on transfers involving lower limb amputees. Focus on IPOPs, EPOPs: Does Early Mobility Benefit Amputees? ↑ Dillingham TD and Pezzin LE. Rehabilitation setting and associated mortality and medical stability among persons with amputations. 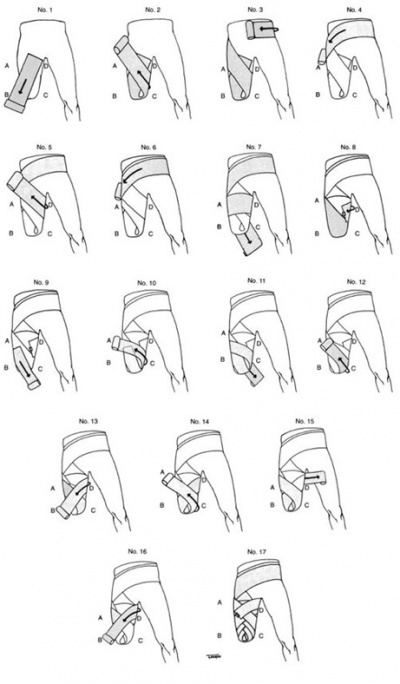 Archives of Physical and Medical Rehabilitation 2008; 89; 1038-1045. ↑ 3.00 3.01 3.02 3.03 3.04 3.05 3.06 3.07 3.08 3.09 3.10 3.11 Lusardi MM, Postoperative and preprosthetic care. In Lusardi, MM, Jorge, M and Nielsen, CC editors. Orthotics and Prosthetics in Rehabilitation, Third Edition. Missouri: Elsevier, 2013.p. 532-594. ↑ Kaplan SL, Outcome measurement and management: First steps for the practicing clinician. Philadelphia, FA Davis Company, 2007. ↑ 5.0 5.1 5.2 5.3 5.4 Esquenazi A. Amputation rehabilitation and prosthetic restoration: from surgery to community reintegration. Disability and Rehabilitation, 2004; 26,(14/15); 831–6. ↑ Esquenazi A, Meier RH. Rehabilitation in limb deficiency. 4. Limb amputation.Arch Phys Med Rehabil. 1996 Mar;77(3 Suppl):S18-28. ↑ Esquenazi A. Amputation rehabilitation and prosthetic restoration. From surgery to community reintegration. Disabil Rehabil. 2004 Jul 22-Aug 5;26(14-15):831-6. ↑ Livingstone W, Van de Mortel TF, Taylor B. A path of perpetual resilience: Exploring the experience of a diabetes related amputations through grounded theory. Contemporary Nursing. 2011; 39(1):20-30. ↑ 9.0 9.1 9.2 9.3 9.4 9.5 9.6 9.7 Gaily RS, Clark CR.Physical therapy management of adult lower-limb amputees. In: Michael, JW editor. Atlas of Limb Prosthetics: Surgical, Prosthetic, and Rehabilitation Principles. Rosemont, IL, American Academy of Orthopedic Surgeons,1992. http://www.oandplibrary.org/alp/(accessed 8 February 2015).